1977-05-30 “FAREWEL AND GOOD LUCK - Dear and Rev. Fr. Ariosto. This is a small remembrance of ours for you to keep. We all wish you the best of Luck, and a bright future. With lots of Love. From all the members of the DBYC [Don Bosco Youth Center] Pratapnagar. God bless you always. May 30, 1977.” Leadership, Families and Youth of Don Bosco Youth Center, Baroda, Gujarat, India. 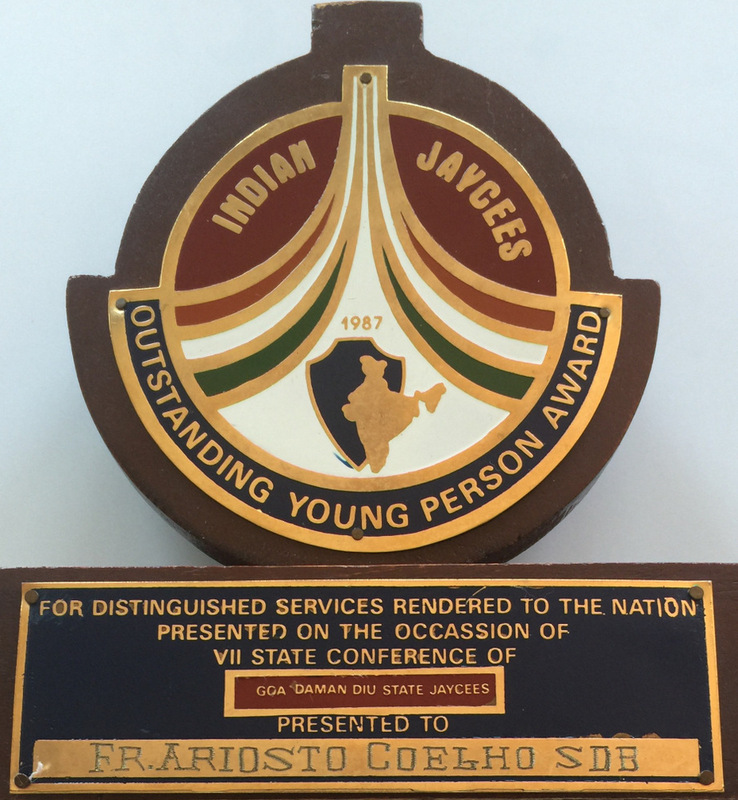 1987- awarded the Outstanding Young Person Award by the Jaycees of Goa, India "for distinguished services rendered to the nation" [1978-87] by transforming the Don Bosco Farm into an Agro-Educational Complex for the poor and the marginalized children and teenagers @ Sulcorna, Goa, India. 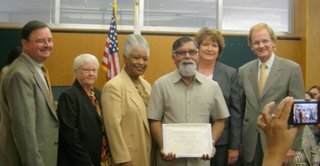 2010- recognized by The Board of Supervisors, County of San Mateo, State of California, for 10 years of service to the people of San Mateo County. "The Board hereby extends its sincere wish for continued success, health and happiness." Signed: Richard S. Godon, President, Mark Church, Carole Groom, Rose Jacobs Gibson, Adrienne J. Tissier @ Redwood City, CA. < Hon'ble Shri Francisco Sardinha, Member of Parliament, Gov't of India [center], Dr. Adi Doctor, Ex-Vice-Chancellor Goa University [left] and the author The Rev. Dr. Ariosto Coelho [right] at the release of Integral Art [ISBN 978-0-615-40788-3 ] at Sunaparant Centre for the Arts in Panaji, Goa India on Feb. 5, 2011 . 2011- “Enlightenment through Art - His Drawings and paintings make you ponder and the spirituality expressed in colour enlightens you. Ariosto Coelho is releasing his new book, Integral Art which speaks about how to awaken, balance and center light and delight. Speaking to Herald, Ariosto defines the ABCD of life and the link between spirituality and integral art.” by Ms. Dolcy D’Cruz @ Herald Features O Herald, Goa’s Heartbeat, Saturday, February 5. 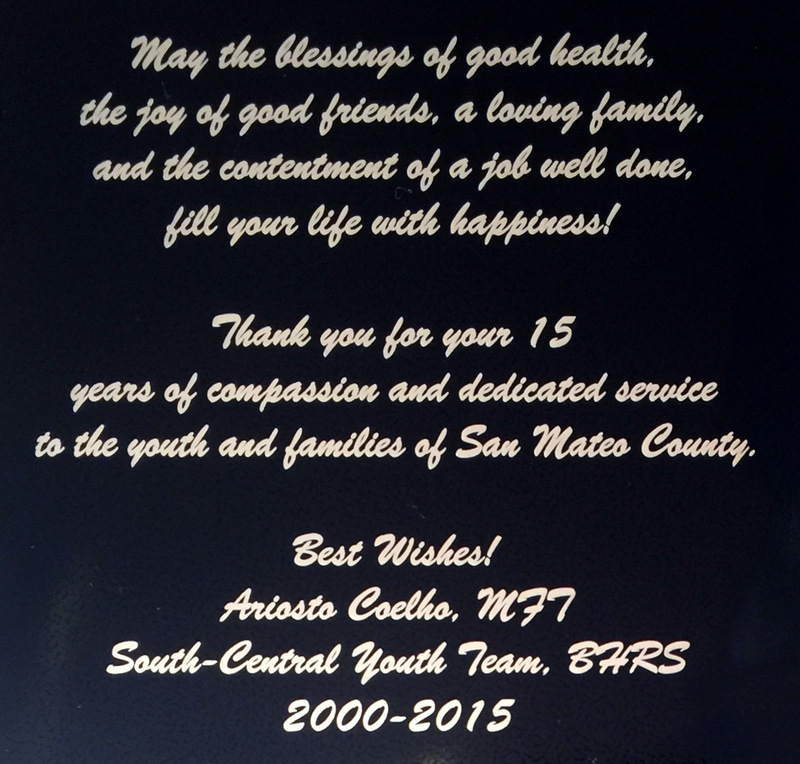 2015- "Certificate of Appreciation awarded to Ariosto Coelho, MFT, in recognition of the excellent work you have provided to the communities of San Mateo County for 15 years. Your compassion and dedication for your work and your clients is admirable. Thank you for sharing your heart, and your gift of flowers from which your spirit shined through for many years. We will miss you. [Signed by the Leadership of] San Mateo County, Behavioral Health and Recovery Services [and South County Youth Services] Paul Sorbo, LCSW, Diane Dworkin, LCSW, Linda Simonsen, LCSW, Ziomara Ochoa, MFT." @ Redwood City, CA. 2016/11/05 "Padre Coelho, Muchas graCias por las celebraciones en la Iglesia El Buen Pastor y la instrucion en la Oficina St. Joseph's Workshop en San Bruno, CA." Padres y Padrinos de Daesha y Denise Chan [2016/11/05 @ San Mateo, CA]. 2015/06/01 "Dear Father, You bring glory to God through your servant heart. Thank you for giving yourself for the good of others. You are appreciated and wished rich blessings. Thanks so much for guiding us through a very difficult time [death and funeral of Mary Castle]. You and Vivian are a true blessing! With love Colleen & Brian McCarty @San Rafael, CA. ← DR. MARY CASTLE [1920-2015] Celebrating her 92nd birthday with the Little Flock at St. John's 1928 BCP Church in Hayward, CA. She was one of the Founding Members of St. John's Episcopal Church in 1988 and a Leader till her last breath on May 22, 2015. 2015/04/01 "Certificate of Appreciation awarded to Ariosto Coelho, MFT, in recognition of the excellent work you have provided to the communities of San Mateo County for 15 years. Your compassion and dedication for your work and your clients is admirable. Thank you for sharing your heart, and your gift of flowers from which your spirit shined through for many years. We will miss you. [Signed by the Leadership of] San Mateo County, Behavioral Health and Recovery Services [and South County Youth Services] Paul Sorbo, LCSW, Diane Dworkin, LCSW, Linda Simonsen, LCSW, Ziomara Ochoa, MFT." @ Redwood City, CA. 2014/09/04 "Father Ariosto, Thank you for officiating our wedding. It was such a special day for both of us and the ceremony was beautiful. Thank you for incorporating all the rituals into the ceremony. Also, we really appreciated the pre-marriage counseling at your place. You are such a warm and welcoming person. Thank you for being such an important part of our wedding. We will always remember you. With much love, Anahi & Ben" 2014/08/30 @ Hillsborough, CA. 2011/09/18 “MANDALAS IN HARMONY: Drawing the Light of Consciousness" A hands-on presentation at Badarikashrama in San Leandro, CA. "Thanks for the wonderful talk and inter active time. I'd like to do more of this delving into the unconscious through art with you. I do think that this was the perfect audience. Even the children were aware of the concepts you were presenting. 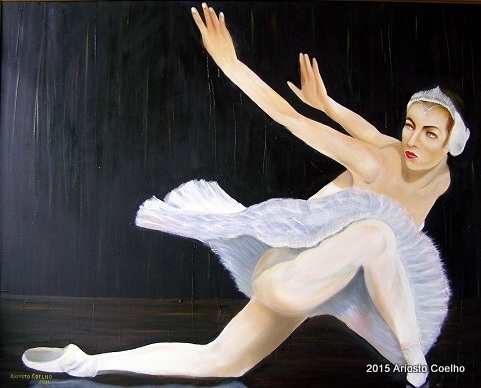 They all appreciated your explaining them in depth and relating them to your art." Filomena Saraswati Giese, an educator from Kensignton, Ca. "I liked that you did not ignore the children, but engaged us actively." Padmini, a 9th grader from Morrow High School, Hayward, Ca. 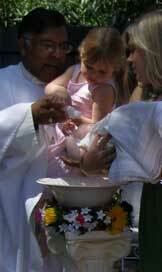 2006/07/29 Father Ariosto Coelho, Thank you so much for being an important part of our special day. The meeting we had with you was great and initiated thoughts and ideas about how we want to grow as a couple. Again - Thank you so much. We appreciate your openness and positive energy you create and exude. Warm regards, Elaine & Stephane Dessus @ Ruby Hills Golf Club, Pleasanton, CA. 2006/05/21 Father Coelho, Thank you so much for your love, blessings and guidance. Your love and direction have helped shine a bright light into our future. Love, Lily & Miguel Escobedo @ Galaxy Commodore Yacht. Alameda CA. 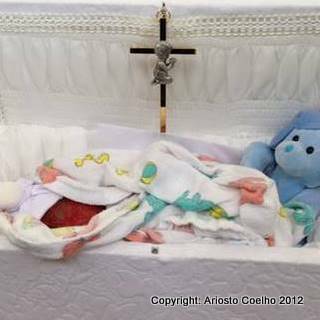 2006/05/13 Dear Father Coelho, I wanted to take this opportunity to thank you once again for inducting our youngest daughter Brooke into the kingdom of heaven. Her Baptism on Saturday was truly a blessed event. Heather & I are so very thankful that you were able to preside over this occasion. Your role or perhaps path within our lives continues to grow as indeed, our bond continues to strengthen. Being in your presence conveys such a very peaceful and soothing aspect to our lives, it’s as though we travel together in spirit on a daily basis. Simply talking with you Ariosto, has to be one of the easiest & most pleasurable things Heather & I both look forward to. Your ability to make others feel comfortable is very sincere & quite obvious. This in turn, provides the ink of which those whom you speak with, are encouraged to add their stroke to the conversational canvas. I have no doubts that our connection is one that shall stand throughout our many life cycles. It is very appropriate, that you have stood with us at our wedding, our eldest daughter Emily, our son Ryan & now our youngest daughter Brooke’s Christening. Both my extended family & Heather’s think the world of you, as do we. Our love & appreciate for your wisdom, guidance & smile can be seen in our faces, as it could of every face in attendance on Saturday. We will talk soon Father Coelho. Very truly yours, Ned & Heather Hagan. Los Altos, CA. 2003/02/16 "I have been privileged to officiate at hundreds of wedding ceremonies in ancient shrines, beautiful churches, awesome gardens, remote forests and serene beaches. 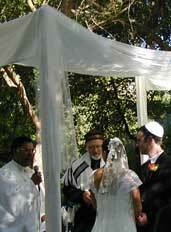 I have prepared bi-racial and interfaith couples, young and old couples, but to this day I have not married a couple whose combined age is over 170, and I ask myself "Why did Jesus choose me for this privileged event? How hast He made me equal unto them?" From Fr. Coelho's homily : marriage of the Elderly ... delivered during the Nuptial Eucharist uniting Ida Cambesi and George Dowling [1912-2005] at St. John's Church in Hayward, CA, USA. 2002/10/06 Fr. Coelho, We’re both honored and blessed to have you baptize our twin daughters today, eight years after you married us. It means so much. Thank you for agreeing to do the service in our backyard. What a very special day this is for our family. You’re a big part of this day. Sincerely, Shannen & James Enos. Castro Valley, CA. 2002/06/21 "Happiness in marriage is not something that just happens: a good marriage must be created." From Fr. Coelho's RITUAL Celebrating the Love of Heather LeAnn Kennedy and Timothy Wayne Rantz at Sand Harbor on Lake Tahoe in Nevada. 1993/12/04 "My dear Alan and Karen: As you embark on THE ADVENTURE OF MARRIED LIFE today, may the WORD OF GOD be a lamp on YOUR PATH TO LOVE AND HAPPINESS. May the prophetic and mystical radiance of God shine on your faces, on the faces of your children and of all those near and dear to you. May you discover and live the most appropriate messages in the readings which you chose for the Eucharistic Liturgy of this your Nuptial Celebration." From Fr. 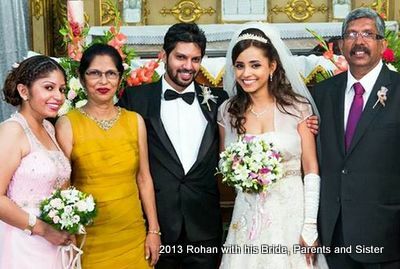 Coelho's HOMILY : My Beloved is Mine ... delivered during the Nuptial Eucharist uniting Karen Coelho and Alan Viegas at St. Michael RC Church in Taleiganv, Goa, India. 1981/02/04 Fr. 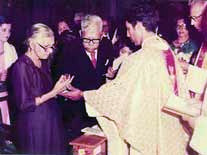 Coelho assists his parents Xavierito Coelho [1900-'87] & Valdemira Reis Fernandes [1907-'94] as they exchange their Golden Wedding Vows and Rings and his younger brother Rosarito Coelho weds Nimmi Cana during the Nuptial Eucharist at Our Lady of the Rosary Church in Navelim, Goa, India. to all couples in love. 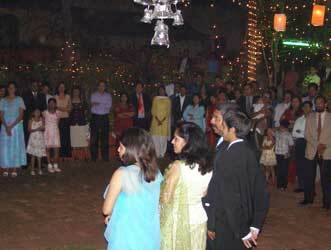 The Silver Wedding Celebration of Rosarito Coelho & Nimmi Cana in Aquem, Goa, India. 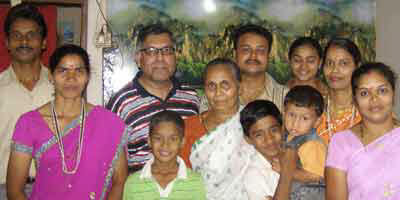 Rebello in Margao, Goa, India. 1987-08-12 “I have always admired the love and dedication with which Fr. Ariosto has gone about his work. He knows how to enthuse everyone young and old; he is generous, kind and forgiving; he dreams of a great many things for the youth of Goa. With his fluency in Hindi, English and Konkani he could relate easily with everyone and understand them deeply. But what I like best is the sense of dignity as human persons he gave to the boys and girls who passed through Sulcorna. No wonder Sulcorna has always been a happy family for each of them. He promoted their all-round development in studies, games, dramatics and work. In this way he showed himself a wonderful educator of the young, especially of the rural poor.” Fr. 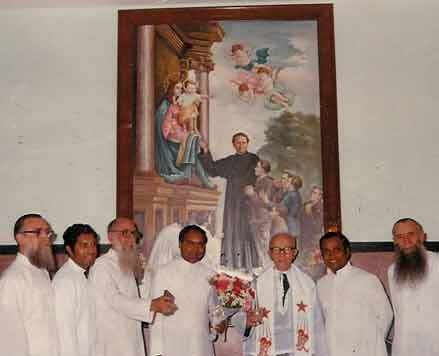 Chrysanthus Saldanha, SDB, Salesian Provincial of Bombay. 1977-05-30 “FAREWEL AND GOOD LUCK Dear and Rev. Fr. Ariosto. This is a small remembrance of ours for you to keep. We all wish you the best of Luck, and a bright future. With lots of Love. From all the members of the DBYC Pratapnagar. God bless you always. May 30, 1977.” Leadership, Families and Youth of Don Bosco Youth Center, Baroda, Gujarat, India. On Sunday afternoons during the Novitiate year [1967-68] at The Retreat in Yercaud near Salem in Tamilnadu, I accompanied fellow novices and other youth workers in order to do youth work in the style of Don Bosco, called Oratory. I was assigned to Kovilmedu Oratory near the local Parish Church building. Oftentimes we had to go from house to house to collect these Tamil boys and girls, divide them into suitable groups and organize activities for them. At the close of two hours we arranged a snack for them and offered them moral or religious education. The following year 1968-69, I opted for more Oratory work and was sent to Langlipet and a few other villages. We walked to and from these villages. It was customary to give the youth, their siblings and parents who showed up, a gift around Christmas. One year the Salesians at The Sacred Heart College at The Retreat had received woolen clothes, a gift from Europe. The Superiors decided that warm clothes or overcoats would make a reasonably good gift, since during the Winter months it gets cold in and around Yercaud, a hill station. Almost all those who showed up at the Oratory that Christmas were gifted an overcoat, some were oversize and did not fit well. The following Sunday, the poor boys and girls who had never worn overcoats in their life, showed up at the Oratory wearing nothing but their warm woolen overcoats, not even underwear. Everyone was amused! In my final year [1969-70] at The Sacred Heart College of Philosophy and Humanities, I chose to lead a team on bicycles to the farm village of Hawthorne, about 6 kms away from The Retreat, where we resided. I recall how on the very first visit, my bicycle got punctured and there was no way to repair the tire or replace the rubber tube. After walking alone with my bicycle for over a km on stony roads in a hilly, dark and isolated terrain, I sought the assistance of a local priest, who managed a Coffee Farm. I am grateful that he drove me back in his Jeep. I also recall that during the Summer of 1969 along with a few students of philosophy I opted to spend ten days and ten nights at the Omalur Leprosarium near Salem. Not only did we assist the professionals in the treatment offered to the patients that showed up at the Leprosarium, but we also traveled with them to the villages within a radius of ten kilometers and reached out to the lepers and families living in those areas. We had regular sessions de-briefing and reflecting in prayer on our experiences. I am grateful that from the age of sixteen I began to learn in practice how to be of service to the unreachable and the poorest of the poor, especially the young.